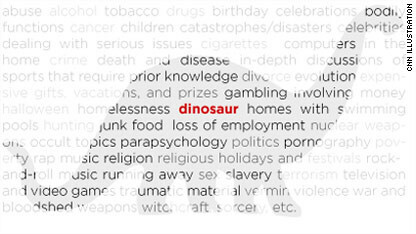 NYC had initially sought to keep words like "dinosaur" and "Halloween" off standardized school tests. New York (CNN) - One week after New York's Department of Education drew controversy with a request to ban 50 words and references from the city's standardized tests – including “dinosaur,” “birthday” and "religion" – the department announced Tuesday that it is abandoning the plan. "After reconsidering our message to test publishers and the reaction from parents, we will revise our guidance and eliminate the list of words to avoid on tests,” New York Chief Academic Officer Shael Polakow-Suransky said in a statement. “We will continue to advise companies to be sensitive to student backgrounds and avoid unnecessary distractions that could invalidate test scores and give an inaccurate assessment of how students are doing," the statement continued. The list of words New York hoped to ban from tests was made public when the city’s education department released this year’s "request for proposal" for test publishers across the country. The city is looking for vendors to revamp math and English tests for its students. The list of words, which included “divorce,” “Halloween,” “Christmas” and “television,” attracted considerable criticism, with many alleging it was political correctness gone too far. In its request for proposal, the NYC Department of Education explained that it wanted to avoid certain words if "the topic is controversial among the adult population and might not be acceptable in a state-mandated testing situation; the topic has been overused in standardized tests or textbooks and is thus overly familiar and/or boring to students; the topic appears biased against (or toward) some group of people." Matthew Mittenthal, a spokesman for the NYC Department of Education, said last week that this is the fifth year his agency has created such a list. The request for proposal said certain words "could evoke unpleasant emotions in the students." Apparently, many of the words on New York’s list were avoided because of faith-based concerns. For instance, the use of the word "birthday" or the phrase "birthday celebrations" may offend Jehovah's Witnesses, who do not celebrate birthdays. A representative for the Jehovah's Witnesses declined to comment on the use of the word "birthday." The Department of Education would not go on the record to explain the specific reasons for each word, leaving many to draw their own conclusions. "Halloween" may suggest paganism; "divorce" may conjure up uneasy feelings for children in the midst of split within their family. The term "rock 'n' roll" was also on the "avoid" list. The New York Post speculated that the "dinosaurs" could "call to mind evolution, which might upset fundamentalists." Stanford University professor Sam Wineburg, director of Stanford’s History Education Group, welcomed Tuesday’s announcement. “It is a courageous move,” he said. “Any time educators reverse a decision that was public, which received air time in the press, it's an act of courage and to recover a position of common sense." « Previous entryMatchmaker, matchmaker, make me … a nose job appointment? Hi there just wanted to give you a brief heads up and let you know a few of the imegas aren't loading correctly. I'm not sure why but I think its a linking issue. I've tried it in two different web browsers and both show the same outcome. I doubt most Jehovah's Witnesses would be offended if others use the word "birthday". Jehovah's Witnesses don't personnally celebrate birthdays because of their previous association with non-christian religious practices. Nevertheless, they Witnesses do not try to dictate what non-Witnesses do.